Exclusion and prevention to keep rats and mice out for good! We can solve any problem/conflict with mice and rats. We not only trap them, we offer a full line of complete solutions for Chicago rat problems. Why is poison a bad idea? We never use poison for rat or mouse control - it's pointless. You spread some poison, it never kills all of the rats or mice, many learn to never touch poison, and new ones just come in to replace the missing ones, or are even attracted to eat the dead ones. And the worst part is that the dead rats usually die somewhere in the attic or walls, and then STINK horribly. Poison is a very bad idea. The proper way to solve a rat or mouse problem is to fully investigate the house and find out how the rats/mice are getting in. Identify all of the points of entry, and then seal them shut - permanently - with steel and other impenetrable sealants. Then trap and REMOVE all of the rats and mice with traps, and the problem is solved for good, without any of the problem of stinking rodent carcasses. We are experts at Chicago rat control and mouse removal. If you are serious about getting a permanent solution to your problem, don't call your lousy poison-spreading pest control company. Call us, and we will get the job done correctly. 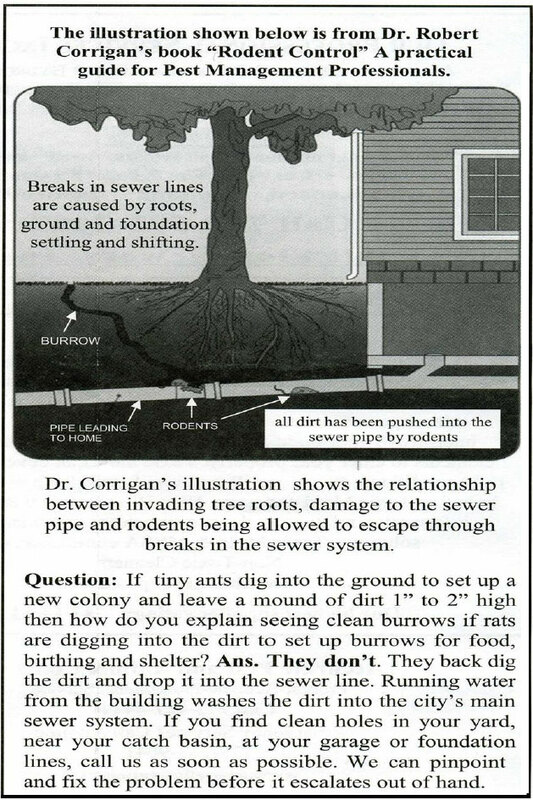 Click the image to the left for an illustration of how rats in Chicago can enter homes via sewage pipes. This is a common problem in Chicago, and a possible cause to a rat infestation. Our company is trained to recognize this type of rat entry, and perform the proper repairs necessary to remedy this source of rat entry. Give us a call for more details if you suspect that you have rodent entry into your home via the sewage lines or any other water pipe. Inspections like this are just part of our Chicago rat exterminator process. The problem isn't solved permanently until all entry areas are found and sealed shut. 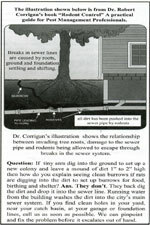 Plumbing issues are especially complex, but we have learned how to properly address them, which is very rare for Chicago rodent control companies. Call us any time to do a full inspection of your building and property. Read more about rats getting in through the plumbing here. Mice or rats in walls and ceilings - Mice can go anywhere inside of a home and that includes walls and ceilings. If you have heard the sounds of mice or have seen the evidence of their transgressions, one thing is for certain: You need to find where the animals are getting inside of your home. Finding the exterior breach is the most important part of rodent control. Patches outside openings will keep new animals from entering the building during and after the trapping process. Mice sealed inside of the home will be trapped and removed through careful placement of snap traps. If you have any doubts of the snap trap's effective use, you can try other trap models that are available. Most “advanced” models have serious flaws or do not kill a mouse in a humane way. Snap traps offer a quick kill with little cleanup. The same cannot be said for glue traps or poisons. On that note, poison should never be used to eliminate mice. Homeowners are inclined to take the risk of a dead mouse in the walls if it means there will not be a body to clean up. Just because the mouse disappears into the confines of your homes does not mean there will not be cleanup. A dead animal will smell soon after the decomposition process starts. If the mouse was in your walls or ceiling, chances are you will have to find the body in one of those locations and remove it. Moth balls and rats - Rats are the gladiators of the rodent world, living and thriving in conditions that would make lesser animals keel over and accept death. When you look at the history of rats and how hardy they are, you begin to realize that simple odor deterrents like moth balls are a paltry attempt at proper rodent control. A rat can survive any number of natural disasters and can live in places where people dare not tread. An animal of this caliber will not think twice about a box of moth balls hidden in the closet or attic. To keep rats at bay, the only thing you can do is to protect you home by keeping up with the building and the landscape. Rats have to get inside before they can become a problem. 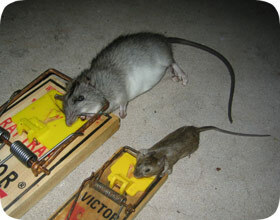 If no holes or openings exist in the exterior of your home, you do not have to worry about rats invading any time soon. Moth balls are best left to their original purpose of killing insects. They were designed for this purpose and do it well. If you are currently dealing with rats, the one and only way to get rid of them is through trapping and removal.